It’s all about measuring butter. I said to Kim (who was preparing for a grocery run tomorrow) that I could use a stick of butter for cooking, and she was surprised: “I thought you’d say cube, not stick.” Me: “I don’t think I’ve ever said cube of butter in my life. It sounds weird to me.” So of course we went searching, and found considerable confusion. noun stick: US a quarter-pound [4-oz.] rectangular block of butter or margarine. Such sticks are 1.25 in. wide, 1.25 in. high, and 5 in. long. A quarter piece of such a stick is then in fact a geometric cube, 1.25 in. on each side. The cube-1 usage, however, was just baffling to us. Why would anyone call the rectangular solids in #1 cubes? 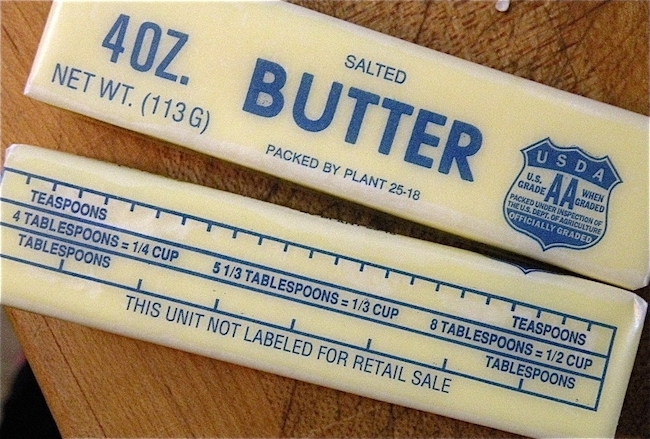 In an American cookbook, a cube of butter is one stick. 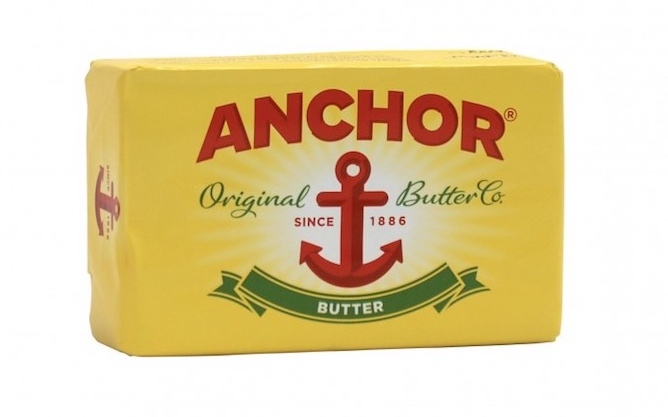 Butter (or margarine) comes in 1 lb. packages, 4 sticks, or “cubes” to a package. Each stick (cube) is 1/2 C. or 8 tablespoons. So if a recipe calls for a cube of butter, you would use one stick (1/2 cup or 8 tablespoons). Other users said they’d never heard of this usage. But one (Imdee) wrote: “I agree with a cube of butter being a whole stick. My mom has always used that term.” Still others were shocked at the amount of butter that would then go into familiar recipes, for instance for fudge. The EC object is clearly a stick, significantly longer than it is thick. But the WC object is a poor instance of a stick, too far from the prototype of the stick category; it’s way too chunky and stubby. The WC object isn’t straightforwardly a cube, but it’s closer to being a cube than it is to being a stick, so cube wouldn’t be a crazy name for it. I know nothing of the commercial history that led to this EC/WC, thin/thick, divergence in butter-stick dimensions. But there it is. We should then expect that cube-1 users are concentrated on the West Coast of the US. Stick is clearly the general US variant, used by people of all regions and ages and by people without associations to food distribution and preparation as well as by those who are plugged into these activities. What remains is to find out who uses cube-1 and in what circumstances; we can collect some self-reports and scare up some more anecdotes — they’ll help to give us some feel for what factors might be relevant — but a real analysis is going to take some big data and powerful analytic tools. Oh yes, and we need to find out how the two types of butter-sticks, the thin ones and the thick ones, are actually distributed in stores. This entry was posted on July 4, 2018 at 3:24 pm and is filed under Categorization and Labeling, Language and food, Lexical semantics, Prototype semantics, Semantics. You can follow any responses to this entry through the RSS 2.0 feed. You can leave a response, or trackback from your own site. Here’s the explanation I read, Elgins vs West Coast stubbies. Just a matter of machinery, they claim. 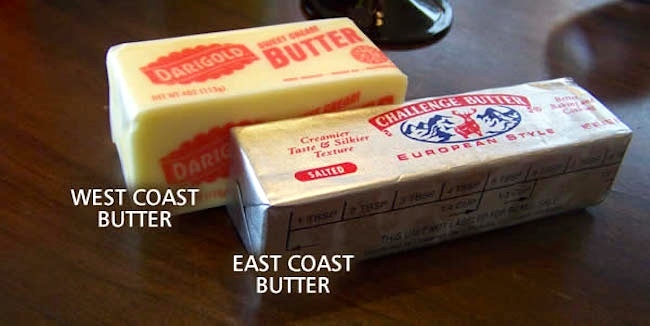 In e-mail, Dan Jurafsky (the foodlingnik) says, on the matter of differences in the referents (EC/WC, thin/thick, skinny/stubby), that he grew up on the West Coast and found the longer skinnier shape of East Coast butter strange the first time he saw it. But on the matter of terms for butter-units, he says he’s never heard cube. The package of butter in the refrigerator contains neither cubes nor sticks, but “quarters”. Bicoastal childhood here. Born Seattle, moved to DC area at age 5, Seattle age 6, DC age 9, Seattle age 14, DC age 16. In most of the country, handwritten recipes will say “stick of butter.” But in the West, they’ll often say “cube of butter.” Basic familiarity with cooking proportions makes an error unlikely. You’re not in any position to say what people do “in most of the country” or “in the West”; all you know is what you remember of your own limited experience. But clearly stick (of butter) is general in the US (so it’s in essentially all the dictionaries, with a clear meaning). Cube (of butter), on the other hand, is equally clearly localized — and, worse, it’s ambiguous. Even worse, it seems that a lot of people who use cube *don’t know* that other people have a different meaning for it, so the stage is set for serious errors. I’ve lived on both EC and WC. I’ve never heard the term “cube” for butter on either coast. The lines are starting to blur, however, thanks to Trader Joe’s, which now exists on both coasts. My local TJ here in New York carries their regular house brand of butter in the stubby California shape. However, their ORGANIC butter is in the longer skinnier shape on both coasts. That shape certainly fits my butter dishes better. Yes, US butter dishes were designed for skinny sticks, not stubby ones. Not at all easy to interpret as linguistic evidence. But at least in Google searches, it seems that cube of butter is a California thing. I have seen the shorter, thicker form here in Massachusetts. I think the Whole Foods house brand comes that way.